When I started turning towards Islam in university, I was faced with the question of abstaining for music. It was a hard decision but I eventually took the plunge and gave it up. It wasn’t an easy journey for me and I moved back to listening to music, then gave it up only to once again start it again. I finally gave it up completely Alhamdulillah over five years ago (May Allah help me stay on this path). There are many who would argue that there is nothing wrong with music, it is just another gift of God, etc. The below just serves to confirm to me that my decision was indeed a wise one, an attempt to raise my level of Taqwa, an attribute that needs constant work from our part. As we enter the last ten days of Ramadan, we will need to start the struggle to continue the momentum of Ramadan. For indeed if we were to walk away from Ramadan without a positive change it would be a big travesty on our part. Your positive change could be giving up music. Insha’Allah I hope the below will help you towards this change. Ramadan Kareem and may Allah (SWT) accept our deeds and have this month serve as time for our forgiveness and for the shower of His mercy. A few months back, the following email sent to the list serve of Al-Huda Canada was forwarded to another list I am on. The content of the email (reproduced below) was amazing. Few weeks ago my daughter, who is in first grade had a science fair at her school. We decided to do an interesting experiment. Our Hypothesis was that listening to Qur’an has physical effects just like listening to music has physically visible effects. 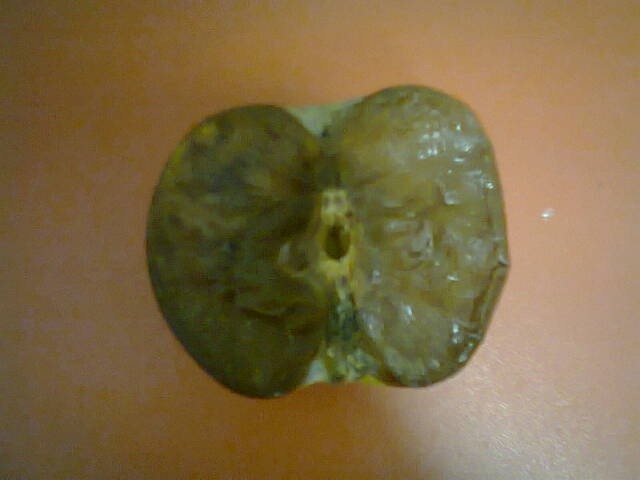 To prove our point we took an apple which also has 60-70 percent water content like human bodies. 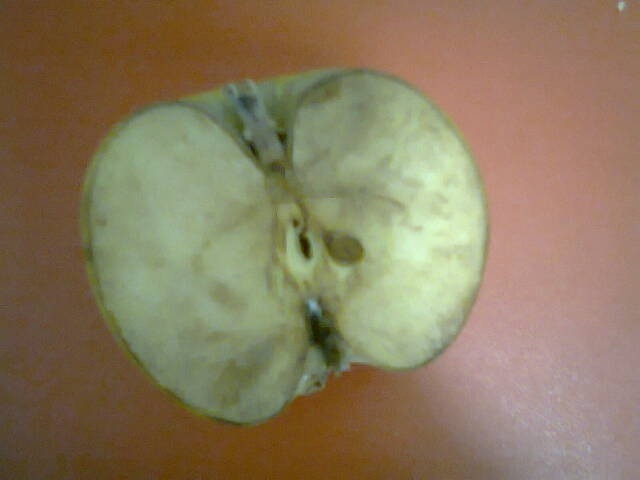 We cut the apple into half, put each half in a zip lock bag and then for seven days played Qur’an for one half of the apple and music to another half of the apple .. 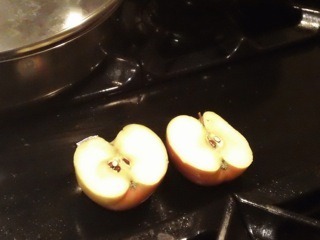 Both apples were kept on room temperature. The results were amazing and so our hypothesis was accepted. Please look at the attached pictures. 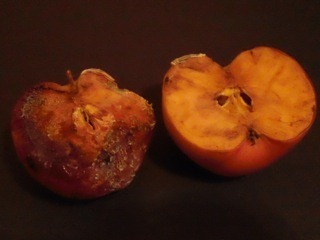 The first picture is of the apple when it was freshly cut. Second picture is after 3 weeks of the experiment. The above account was amazing. Thus, the staff at Reflections, a school in Karachi repeated the experiment to verify it. Below is the email sent by Asim Ismail, the Islamic curriculum head of the school. For two weeks the teacher played music in front of half of an apple for 10 mins daily. While qirat was played in front of the other half for the same duration…the pictures speak for themselves (original pictures)…the rotten half is the one which heard music, and the comparatively fresh one was made to listen to Quran’s recitation… SUBHANALLAH! 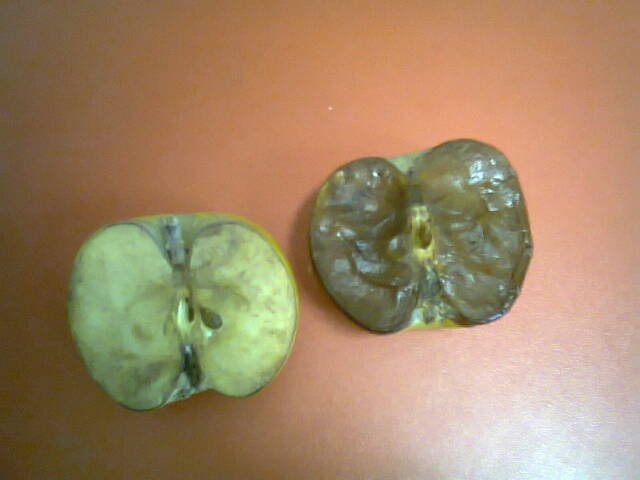 one more amazing thing is the Quran apple has a good smell and the other one u can imagine. Subhan’Allah. May Allah help us to protect our hearts from corruption and to heal it with the remembrance of Allah (SWT) and the recitation of the Quran. Aameen. right path – Aameen Soumma Aameen…..
Mashallah – Ya Allah please forgive us and guide us to the right path..
May ALLAH the almighty bless you and gives you all the best in life. Ameen. If a music lover were to conduct the same experiment I’m guessing the apple half exposed to music would be the better preserved – why? The person conducting the experiment’s intention and bias affect the outcome – thoughts and intentions are powerful. Try it yourself then if you don’t believe it. Seriously??? You really decided to refute this experiment? Try it buddy!!! Plus you will get an opportunity to listen to the healing vibrations of Quraan. This experiment intrigues me a great deal and I think it is true but I feel this study is incomplete. Based on experiments which officially started in the 1940’s it was ascertained that plants grow best to north Indian classical tabla and sitar and then second best was classical english music. Plants had no reaction to country and western music. In my mind in order to prove that plants grow best while being recited the Quran we have to know what music was being played to the other apple? I think you guys are doing good work and I really want the Quran to be the winner but I would like it if this research could be taken further?